Looking for a casual medival city builder. 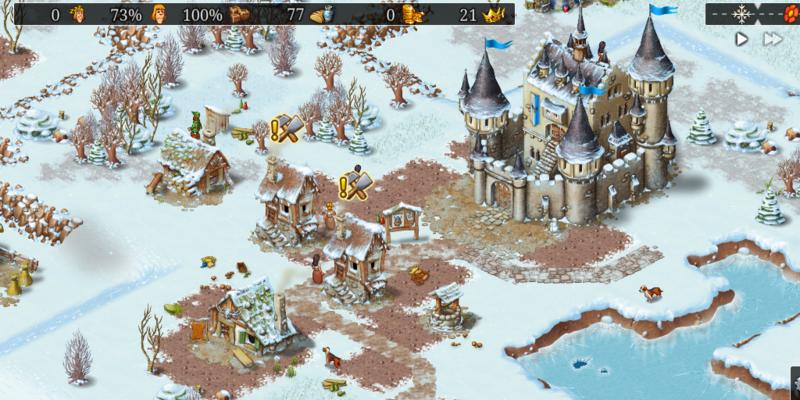 We are – so we got the chance to play Townsmen. Here we go…. A casual city builder is what you sometimes need to wind down with. The game turned out pretty simple to play but tough to master. Its about building a settlement, nice and easy you may think. This game has a laid back and casual feel and it takes it across the game. Starting each level, you have a basic camp and then you build it to become a bigger settlement – to a large city. Challenges happen and the seasons change – winter will offer different challenges to autumn. More Water needed in summer and more clothes in winter. Setting up the encampment, been a casual city builder its all about building it to how you want. However one bit of advice we would give is play the tutorials. There is a specific build order that needs to be followed and slowly. Do not build too much to soon. Those are just the basics. We could say more – but if you play it – we wouldn’t want to ruin it for you. It feels bit uneven; we like the styling but all to often the town you create hits a point where you have to wait. On initial play through’s, we blindly went through seeing how quickly we could pick it up – after 20 mins we hit an impasse. It was not clear what direction to go – and that hurt it drastically on pick up and playability. At its current price point is it worth it, maybe. It ebbs and flows ok, with a steep learning curve. Would we go back to it if we had to – yep. Would we buy it at this price – probably not.